Sedimentology encompasses the study of modern sediments such as sand, silt, and clay, and the processes that result in their formation (erosion and weathering), transport, deposition and diagenesis. Sedimentologists apply their understanding of modern processes to interpret geologic history through observations of sedimentary rocks and sedimentary structures. Sedimentary rocks cover up to 75% of the Earth's surface, record much of the Earth's history, and harbor the fossil record. Sedimentology is closely linked to stratigraphy, the study of the physical and temporal relationships between rock layers or strata. The premise that the processes affecting the earth today are the same as in the past is the basis for determining how sedimentary features in the rock record were formed. By comparing similar features today to features in the rock record—for example, by comparing modern sand dunes to dunes preserved in ancient aeolian sandstones—geologists reconstruct past environments. Middle Triassic marginal marine sequence of siltstones and sandstones, southwestern Utah. There are four primary types of sedimentary rocks: clastics, carbonates, evaporites, and chemical. Clastic rocks are composed of particles derived from the weathering and erosion of precursor rocks and consist primarily of fragmental material. Clastic rocks are classified according to their predominant grain size and their composition. In the past, the term "Clastic Sedimentary Rocks" were used to describe silica-rich clastic sedimentary rocks, however there have been cases of clastic carbonate rocks. The more appropriate term is siliciclastic sedimentary rocks. Carbonates are composed of various carbonate minerals (most often calcium carbonate (CaCO3)) precipitated by a variety of organic and inorganic processes. Typically, the majority of carbonate rocks are composed of reef material. Evaporites are formed through the evaporation of water at the Earth's surface and most commonly include halite or gypsum. Chemical sedimentary rocks, including some carbonates, are deposited by precipitation of minerals from aqueous solution. These include jaspilite and chert. Sedimentary rocks provide a multitude of products which modern and ancient society has come to utilise. Ceramics and industrial materials: clay for pottery and ceramics including bricks; cement and lime derived from limestone. Energy: petroleum geology relies on the capacity of sedimentary rocks to generate deposits of petroleum oils. Coal and oil shale are found in sedimentary rocks. A large proportion of the world's uranium energy resources are hosted within sedimentary successions. Groundwater: sedimentary rocks contain a large proportion of the Earth's groundwater aquifers. Our understanding of the extent of these aquifers and how much water can be withdrawn from them depends critically on our knowledge of the rocks that hold them (the reservoir). Heavy minerals (dark) deposited in a quartz beach sand (Chennai, India). The aim of sedimentology, studying sediments, is to derive information on the depositional conditions which acted to deposit the rock unit, and the relation of the individual rock units in a basin into a coherent understanding of the evolution of the sedimentary sequences and basins, and thus, the Earth's geological history as a whole. The scientific basis of this is the principle of uniformitarianism, which states that the sediments within ancient sedimentary rocks were deposited in the same way as sediments which are being deposited at the Earth's surface today. Sedimentological conditions are recorded within the sediments as they are laid down; the form of the sediments at present reflects the events of the past and all events which affect the sediments, from the source of the sedimentary material to the stresses enacted upon them after diagenesis are available for study. 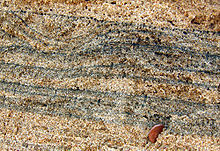 The principle of superposition is critical to the interpretation of sedimentary sequences, and in older metamorphic terrains or fold and thrust belts where sediments are often intensely folded or deformed, recognising younging indicators or graded bedding is critical to interpretation of the sedimentary section and often the deformation and metamorphic structure of the region. Folding in sediments is analysed with the principle of original horizontality, which states that sediments are deposited at their angle of repose which, for most types of sediment, is essentially horizontal. Thus, when the younging direction is known, the rocks can be "unfolded" and interpreted according to the contained sedimentary information. The principle of lateral continuity states that layers of sediment initially extend laterally in all directions unless obstructed by a physical object or topography. The principle of cross-cutting relationships states that whatever cuts across or intrudes into the layers of strata is younger than the layers of strata. Centripetal desiccation cracks (with a dinosaur footprint in the center) in the Lower Jurassic Moenave Formation at the St. George Dinosaur Discovery Site at Johnson Farm, southwestern Utah. The longstanding understanding of how some mudstones form has been challenged by geologists at Indiana University (Bloomington) and the Massachusetts Institute of Technology. The research, which appears in the December 14th, 2007, edition of Science, counters the prevailing view of geologists that mud only settles when water is slow-moving or still, instead showing that "muds will accumulate even when currents move swiftly." The research shows that some mudstones may have formed in fast-moving waters: "Mudstones can be deposited under more energetic conditions than widely assumed, requiring a reappraisal of many geologic records." Macquaker and Bohacs, in reviewing the research of Schieber et al., state that "these results call for critical reappraisal of all mudstones previously interpreted as having been continuously deposited under still waters. Such rocks are widely used to infer past climates, ocean conditions, and orbital variations." Considerable recent research into mudstones has been driven by the recent effort to commercially produce hydrocarbons from them, in both the Shale gas and Tight Oil (or Light Tight Oil) plays. ^ Raymond Siever, Sand, Scientific American Library, New York (1988), ISBN 0-7167-5021-X. ^ Georges Millot, translated [from the French] by W.R. Farrand, Helene Paquet, Geology Of Clays - Weathering, Sedimentology, Geochemistry Springer Verlag, Berlin (1970), ISBN 0-412-10050-9. ^ Gary Nichols, Sedimentology & Stratigraphy, Wiley-Blackwell, Malden, MA (1999), ISBN 0-632-03578-1. ^ Donald R. Prothero and Fred Schwab, Sedimentary Geology: An Introduction to Sedimentary Rocks and Stratigraphy, W. H. Freeman (1996), ISBN 0-7167-2726-9. ^ Juergen Schieber, John Southard, and Kevin Thaisen, "Accretion of Mudstone Beds from Migrating Floccule Ripples," Science, 14 December 2007: 1760-1763. See also "As waters clear, scientists seek to end a muddy debate," at PhysOrg.com (accessed 27 December 2007). ^ Joe H. S. Macquaker and Kevin M. Bohacs, "Geology: On the Accumulation of Mud," Science, 14 December 2007: 1734-1735. ^ Robert G. Loucks, Robert M. Reed, Stephen C. Ruppel, and Daniel M. Jarvie "Morphology, Genesis, and Distribution of Nanometer-Scale Pores in Siliceous Mudstones of the Mississippian Barnett Shale", Journal of Sedimentary Research, 2009, v. 79, 848-861.